A beautifully bespoke golden glitter personalised name Easter egg bag filled with chocolate eggs. Such a cute Easter gift! Perfect for all the family. This handmade personalised Easter egg gift is re-useable and can be filled with lots more goodies. 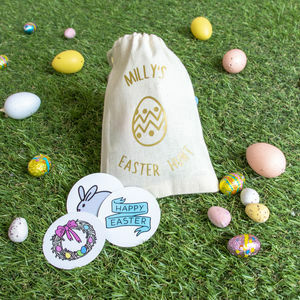 It is a unique Easter gift for your child, grandchild, niece, nephew or treat for yourself - children and adults alike will love this! 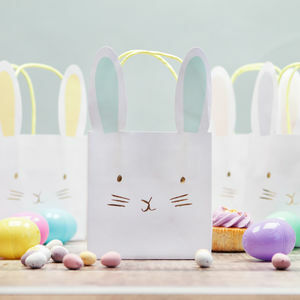 You can use them as Easter table favour bags & for gift wrapping more Easter chocolates and sweet treats. It is a handy letterbox size to post onto friends & family. Or to dot around the garden for an Easter egg hunt! COPYRIGHT : Designed, printed and packed in the United Kingdom by So Close Studios. 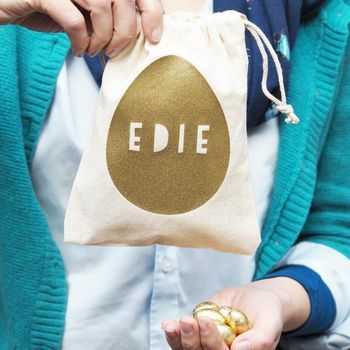 Your bag & eggs will be packaged in cello and placed in a brown box with gold tape and stickers. 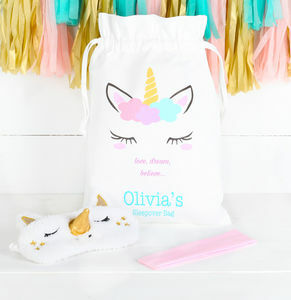 100% natural cotton bag with gold glitter vinyl. Wash inside out on a cool setting. Do not iron printed area. Milk Chocolate contains: Cocoa Solids 25% Min. Milk Solids 14% Min. Sugar, Cocoa Butter, Skimmed Milk Powder, Cocoa Mass, Whey Powder (MILK), Lactose (MILK), Milk Fat, Emulsifier: Soya Lecithin, Natural Flavouring. Allergy Advice: For allergens, see ingredients listed in uppercase. 15 x 18 cm drawstring bag.